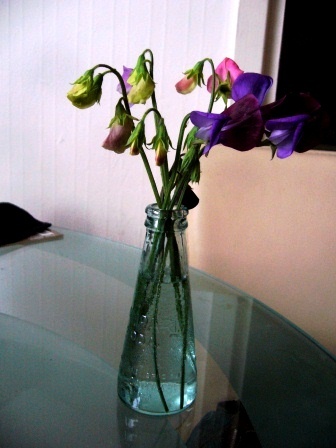 The Man and I don’t knowingly grow too much that isn’t edible on the allotment but I have a soft spot for sweet peas. I’m yet to grow them as well as my Dad, but they grow well enough to keep me happy. I love the fine yet sturdy stems and delicately drooping flowers; the smell takes me straight back to childhood summers. 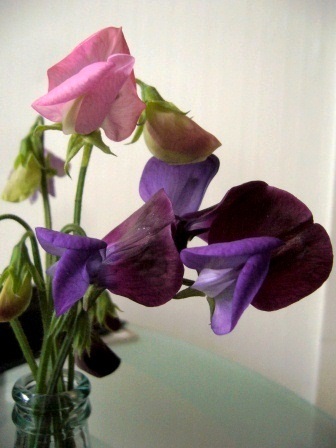 These sweet smelling lovelies are from a pound shop packet of seeds and so far have proved very good value. I work from home quite a lot and having a bunch on the table while I work is a real pick me up, and that’s worth much more than a pound! ← tofu sloppy joes…sloppy toes??? Oh no, it’s frustrating isn’t it? This is the first year we have really had any to speak of. The flowers from your allottment are amazing, such lovely flowers, I think they would go brilliantly at a minimalistic wedding. Thats such a lovely comment, I’ve often thought they would make nice wedding flowers and they smell wonderful too.